Is your little (littlest??) one an upcoming Messi or Ronaldo, but he’s a smidge too early in his career for his first Adidas Telstar? This is a PERFECT solution. 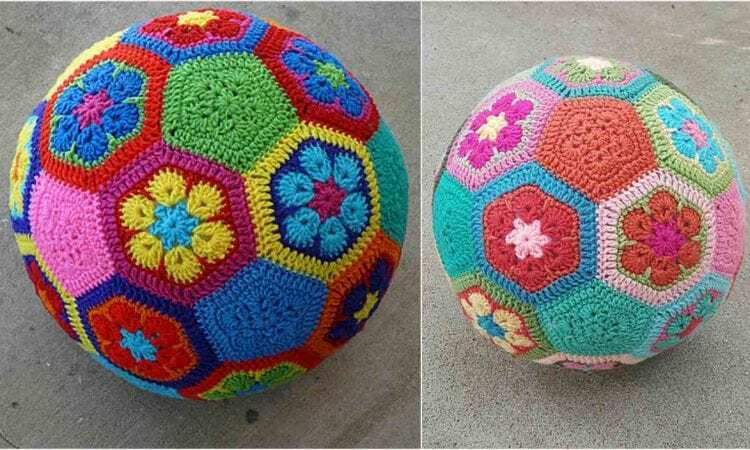 The african flower soccer ball is crocheted out of pentagons and hexagons just like a traditional “ladybug”. Each hex- or pentagon is crocheted separately, then they are stitched together into larger panels, which are then sewn together. The ball is stuffed tightly with fiberfill, and closed. Your little guy can then practice his free kicks and dribbing… both with the ball and onto it, because it’s totally safe for those little soccer stars that still have to taste everything in their world. Link to the pattern is at the end of the post. Estoy muy sorprendida por la presentación de labores tan bonitas, algunas se ven fáciles, pero creo que el ver es una cosa y el hacer y muy diferente. La verdad lo más que me sale bien, son las cadenas y los macizos, pero no me doy por vencida, si algo me gusta, aunque se vea super difícil, trato de sacarlo a como Dios me de a entender. Así hice una cobija para mi niño Dios y la alabaron mucho, pero si supieran lo que sufrí, pero me sentí muy contenta y sobre todo que era para el niñito Dios.